1. This project and funding is not tied to a Master Civic Plan or any comprehensive plan for the 18 acre civic parcel. This is fast-tracked, parcel project for the Hillview Community Center and does NOT include any improvements to the Library, Police HQ, Theater, City Hall, or Open Space. This proposed project is fixed to southwest residential corridor of the Civic property with planned traffic and access from residential streets. 2. The ill-defined cost model and project specify a rebuilt, super-sized Community Center and Multiple Swimming Pool aquatic center, underground parking and relocation of sports fields, at the expense of Parks and Open space land use. This is the single largest proposed construction for a Civic or Community center project in Los Altos, or any Bay Area city. 4. Additional taxpayer funding of $25 Million dollars will be paid from City Reserves already allocated, or in lieu of necessary city-wide capital improvements, identified and unfunded projects, downtown parking, storm drain repair, emergency response, etc. or other higher priority citywide needs. 5. Operating costs are unknown and not yet analyzed or budgeted and will have to be paid by other tax dollars from residents. The current cost model also does not include furnishing, fees, subsidies, insurance, staffing to support these facilities. The multi-pool swim facility makes a claim that it will be "self-supporting," yet there is no financial analysis of how this will be accomplished. 6. 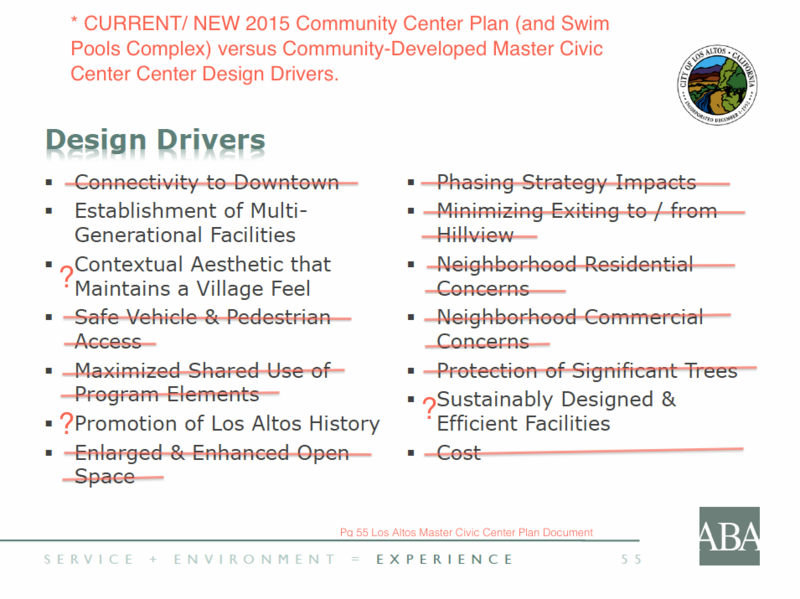 The Community Center Plan is scoped to build over Park space, and needed green outdoor community elements. This plan excludes or eliminates unstructured (non-sports field) lawn areas, fitness and play areas, picnic and community gathering space, and residential green buffer zones. (There is 1,276 sq feet currently set aside for micro play areas in the conceptual plan. )No consideration was given to how the green areas at Hillview Park are currently used ---to walk dogs, exercise, run, play, stroll, picnic, host outdoor concerts or gather with friends and family ---outside of a walled building or fenced sports area. Concrete, fences, and buildings aren't Park elements, period! 8. The project fixes in an unwarranted Swim Aquatic Center with multiple pools (2 separate swim team and training pools and 1 wading pool as planned in approved Environmental Report), competitive team bleachers and separate building, concreting in 38,000+ square feet of hardscape and fencing over Hillview Park. About the same size as a downtown city block. Citywide Community Surveys and Godbe Research polls prioritize important facilities and expenditures including the Library, Parks, Open Space, Safety/Police, and other City services at the Top of the List. What was at the bottom of the list, and considered NOT A PRIORITY or important for the community? 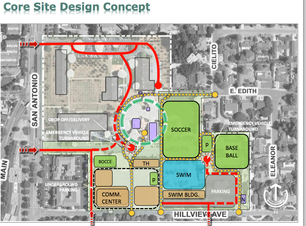 The answer is Swimming Pools, and yet they are fixed to this location and Hillview Community Center project. 10. The scale and size of these facilities scope them for Rentals, conferences, team usage, daily use fees –leading to unaddressed revenue expectations, costs, and traffic in Los Altos. And will require marketing for use as rentals by residents outside of Los Altos. As an example from the current City proposal and plan, the draft Multi-Pool Swim schedule for "a self-supporting model" prioritizes competitive team use and training over recreational swim–showing 2 hours of proposed recreational swim per day. The Community Center, without visitor analysis of the existing center proposes expanded facilities for undetermined multi-generational needs. Dedicated senior facilities are only appropriated 1000 square feet in this proposed conceptual design, with other space to be filled by unknown programming, stakeholder meetings and rentals. The City has already spent over $1 Million taxpayer dollars on "bond consultants", planners, facilitators and “educational materials” leading up to project approval through Measure A. The communication and decision process for this project comes into question by a a process favoring stakeholders and special interest groups over solid financial analysis, citywide quantitative studies and validation, or understanding how the community uses the current Hillview facilities. 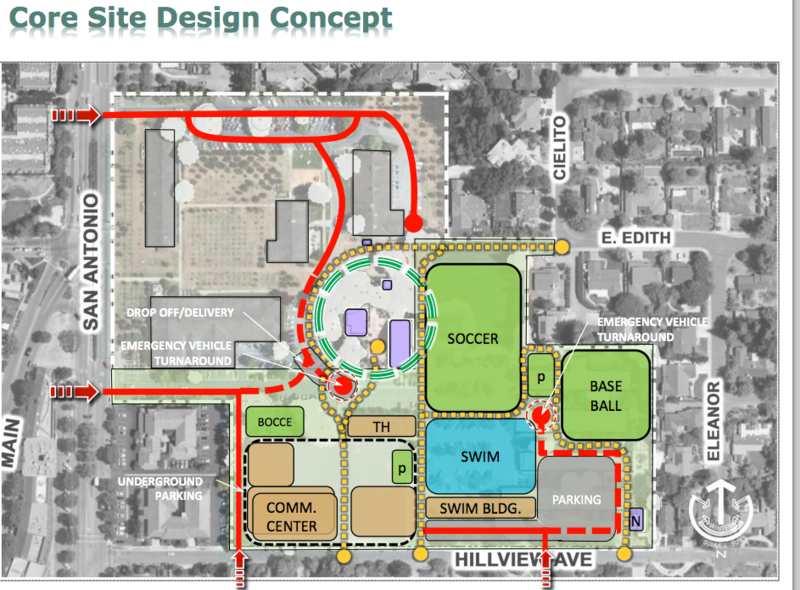 NOW taxpayers are being asked to partially fund this flawed Hillview Community Center project with limited details on the proposed projects details, total taxpayer costs or impact to the City and community. We all want a revitalized, right-sized replacement for the Community Center on the Civic property ---and welcome new ideas for places and spaces, both outdoor and indoor, where the Community come together. This proposal however is far beyond the size, needs, costs and priorities for Los Altos residents, neighbors and our community---and burdens every resident with increased taxes and unknown future costs. "NO WAY, No MEASURE A !" Unknown millions- Ops cost, furniture, maintenance..
TOTAL = $160 Million…..and counting. Too Expensive. Too Big. Wrong Priorities. MEASURE A DOESN'T MEASURE UP!